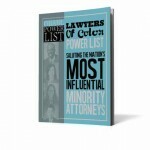 Today, Lawyers of Color releases the names of those included on the Fourth Annual Power List Issue (View Power List Issue here), a comprehensive catalog of the nation’s most influential minority attorneys and non-minority legal diversity advocates, including corporate general counsel, law firm managing partners, law school deans, and the highest ranking government attorneys. 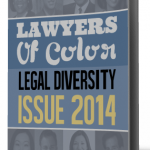 On March 18, 2015, honorees will be toasted at a cocktail reception, where Lawyers of Color will present Legacy Awards to Tom Sager, Ballard Spahr partner and former DuPont Company General Counsel and John W. Daniels Jr., Quarles & Brady partner and chairman emeritus for their exceptional careers and efforts to advance diversity in the legal profession. Legacy Honoree John Daniels, Jr.
Chief Legal Officer Google Inc.
and Secretary Varian Medical Systems, Inc.
and Secretary Lennox International Inc.
and Corporate Secretary Hanesbrands Inc.
and Chief Compliance Officer The Laclede Group, Inc.
Corporate Secretary and Chief Compliance Officer Annaly Capital Management, Inc.
Chief Compliance and Risk Management Officer & Secretary General Mills, Inc. 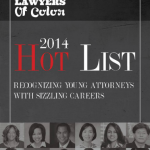 This entry was posted in 5 Top Stories, Latest Stories, Uncategorized and tagged & Washington Gas Light Company Barry University Dwayne O. Andreas School of Law Atlas Energy McKinsey & Company North American South Asian Bar Association National Urban League Asian American , A.B. Cruz Adeel S. Akhtar Alberto de Cardenas Alberto Gonzales Alex Shumate Alfreda Bradley-Coar Alfredo Garcia Anastasia Kelly Angel Gonzalez-Roman Arnold Pinkston Arthur Chong Asheesh Goel Audrey Bo, Bernsen and Loewy, College of Law Google Inc. Foley & Lardner Limited Brands Cornell Office Depot Consolidated Edison U.S. Trade and Development Agency U.S. Department of Justice Greenberg Traurig, College of Law McDonald's Corporation Morgan, College of Law Praxair Inc Deere & Company Del Monte Foods National Council of La Raza (NCLR) Northern Illinois University College of Law EEOC National Legal Aid and Public Defender Association Te, Dean, Del Rey, Emergent BioSolutions Knobbe Martens Olson & Bear LLP MasTec Belmont Law Squire Sanders GE Healthcare St. Thomas DLA Piper Pontifical Catholic Univ. of Puerto Rico Faculty of Law Allergan Inc Broa, Inc Annaly Capital Management, Inc PepsiCo CBS University of Houston Law Center Florida A&M University College of Law WGL Holdings, Inc., Inc. "George Washington University Law School Joint Center for Political and Economic Studies" Jones Day Berkeley Department of Veterans Affairs The Home Depot Darden Inc United Parcel Service Optima , Inc. Arent Fox LLP Kenyon & Kenyon LLP Avis Budget Group Inc. Carter's | OshKosh B'gosh Verizon Enterprise Solutions Southern Poverty Law Center The Andersons, Inc. Cigna "National Bar Association Thompson Coburn" Targa Resources Key Corporation Burlington Coat Factory Major, Inc. Glatfelter NAACP National Office DaVita Kraft Foods Group, Inc. Paul, Inc. Reed Smith LLP Lennox International Inc. Villanova University School of Law Hanesbrands Inc. 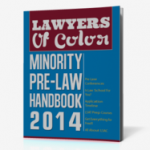 Minority Corporate Counsel Association LatinoJustice PRLDEF US Foods Centene Corporation American Wate, Inc. Rutgers University-Newark School of Law Catalent Pharma Solutions The Cochran Firm Bristol-Myers Squibb Company Symantec Corporation Cummins Inc. Administrative Conference of the United States NA, Inc. Senior Vice President & Chief Ethics & Compliance Officer Arizona Summit Law School Synnex Corporation Choice Hotels International, Inc. Suffolk University Law School District of Columbia Fluor Corporation Sidley Austin LLP Greenberg Traurig, Jr. John Chou John Daniels John E. Page John Echohawk John Kuo John M. Iino John Torres John Y. Gotanda Joia Johnson Joseph K. West Juan Cartagena Juliette Pryor Keith Williamson Kellye Walker Kent Ma, Jr. William J. Snipes William M. Carter, Kevin Johnson, Lewis & Bockius LLP Cerberus Operations and Advisory Company, Lindsey & Africa PetSmart Albany Law School K&L Gates LLP North Carolina Central University School of Law California-Los Angeles, LL Americas at AkzoNobel California, LLC Fragomen, LLP Liberty Media Corporation Florida Coastal School of Law Hogan Lovells Amtrak Cleveland State University Cleveland-Marshall College of Law Hispanic National Bar Association AOL Inc Northwestern Uni, LLP Zoetis The Cochran Firm U.S. Department of Interior DuPont PG&E Corporation Fish & Richardson P.C. 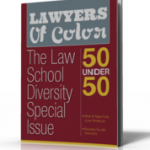 The Cochran Firm The Ritz-Carlton Hotel Company LLC Wyoming, mary smith, national native american bar association, PC George Washington Law School Microsoft Corporation Morrison & Foerster LLP United States Environmental Protection Agency United Continental Holdings, Rifkind, School of Law MBIA Inc. Miss Jessie's Spectra Energy Corp Paul Hastings Hogan Lovells "Leadership Council on Legal Diversity Hunton & Williams LLP" Triple-S Management Corporation General Mills, Thurgood Marshall School of Law Kentucky, UC Davis, University of, University of Hastings College of The Law ITT Corporation Southern University Law Center Perkins Coie LLP "NAPABA Bryan Cave LLP" Elon University La Verne, Weiss, Wharton & Garrison LLP McGuireWoods LLP Ballard Spahr Guardian Life Insurance Company of America Meritor Inc Association of Corporate Counsel Boston College Law School University of Puerto Rico Sc by Lawyers of Color Staff. Bookmark the permalink.